Since GiLoCatur does not have the final ranking and results for Under 14 category, just check out below photos snapped by GiLoCatur's 9-year-old son, Fahim Al-Faqeh. There was a slight change in the info as per reported earlier regarding the top seeds in the U10 category. Wong Yinn Loong was actually playing in the U12 category. So, the MSS Selangor L12 player, 10-year-old Yee Jian Yang became the top seed followed by Ng Jen Sheng who is rated at 1501. So, who emerged the winner in this category? Jian Yang was defeated by Lau Matthew from Singapore in the final round. With 5/6 points and Buchholz tie break of 24.5, he was placed sixth. Meanwhile, Jen Shen stopped another Singaporean player named Lew Zhi Hong from winning one-two placings. Fahim (above picture), GiLoCatur's youngest son, took part in this event. Seeded 14th, he won all his first four rounds. In the fifth round, he lose to Jian Yang at the top table. Even though he won the final round and had 5/6 points, he was not on the podium since the winners medal is only for the top seven placings. 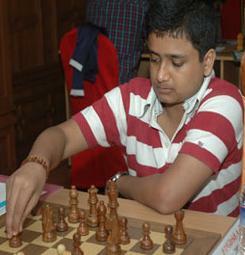 Fahim was among ten players who scored 5/6 points but had lower tie break. He was placed tenth. Even though there were 12 Iranian and 7 Singaporean youngsters took part in the U10 category, Fahim played against only one of them. In the second round, Fahim played black against Singaporean Kow Jonathan. The match was the longest for him and among the last ones to finish. It was unfortunate for Fahim to not play against the Iranian youngsters as this will give him different experience, exposure and perspective. Below is the final ranking of the top 20. To view the complete final ranking list, go to this link. 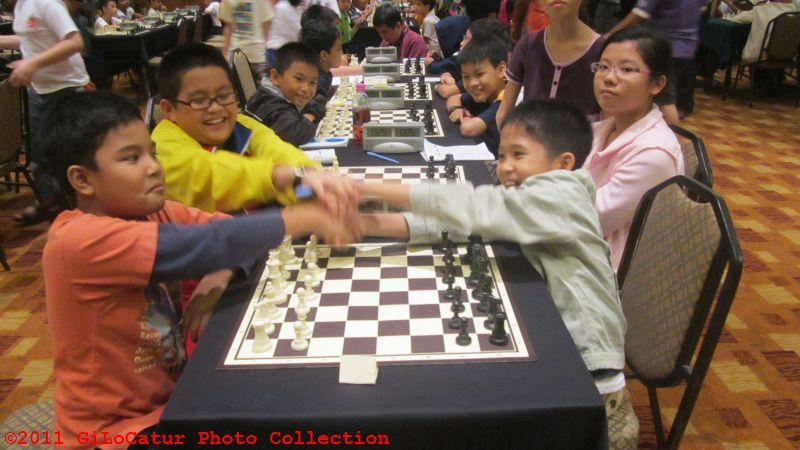 The sixth seed, 1342-rated Chua Jia-Tien emerged top after scoring 5.5/6 points in the Under 8 category of the 2nd Swensen Age Group Rapid Open last Sunday. Jia-Tien had the same points with the top two seeds, Tan Jun Ying and Muhammad Faqih Aminuddin from Shah Alam but had higher tie break. Three players were paired out meaning only 74 players were participating. There were 8 Iranians and 3 Singaporeans took part in the event. Six of them were in the top 20 final ranking as shown below. Click here for the complete final ranking. It is about an hour past midnite of Sunday, 21st August 2011. Today at 9.00am, the 2nd Swensen's Age Group Rapid Open will begin. GiLoCatur prefers to call it the Merdeka Age Group. Such is the only event GiLoCatur's children take part in this year Malaysian Chess Festival. It was the same last year. 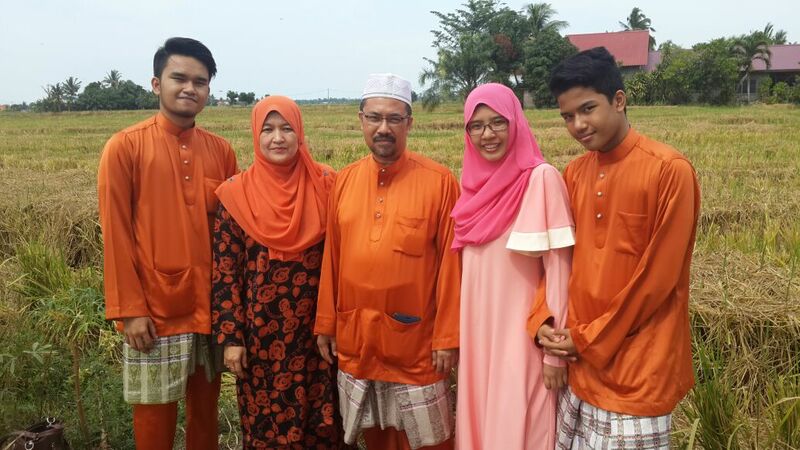 Last year, GiLoCatur's daughter did not take part due to UPSR examination. But this year, she will participate in Under 14 age group. Since Fikri is busy preparing for his PMR exam this year, he will miss the event. Nine-year-old Fahim, GiLoCatur's youngest child, will play in Under 10 category. Last year he was among nearly sixty players who took part in Under 8 category. 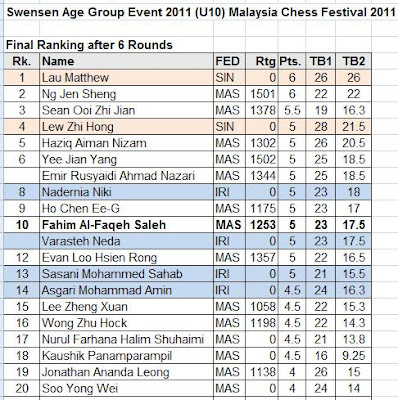 Fahim scored 5 points and was ranked eleventh overall. Let's check some statistics and info regarding the participants. Last year, the total number of players in this category is only 57. So, this year it is 20 more. Fahim is seeded 15th. The number of participants this year is almost double than last year which is 78. What GiLoCatur observes regarding the ratings of the top 3 seeds, this year is higher than last year, 1500s to 1400s. Last year there were only 53 participants in this event. The top two seeds are foreigners. The Malaysian players can test against the Australian top seed who has ELO ratings of 2013. Anis who is seeded fifth in this category may have the chance to play against the Iranian players. This category attracted only 34 players last year. This category attracts the least number of participants. Only two more this year compared to last year. Can the Malaysian players stop Bryan Lee from Hong Kong being the champion? Just wait until the age group championship completes. So, in short, this year edition attracts many more participants. Hopefully, the number will be higher next year. See you at the Cititel BALLROOM in about 7 hours. In the women event, the champion or gold medallist will be decided by the top three boards. 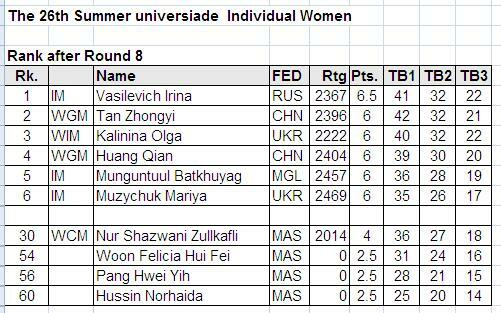 As per shown by below ranking after Round 8, IM Irina Vasilevich from Rusia is leading five 6 pointers by half point. If she wins against IM Batkhuyag Munguntuul of Mongolia, she will surely win the gold medal. But if she draws, the tie break will determine who is the winner provided that there is a winner at the other two top boards (i.e. board 2 and board 3). 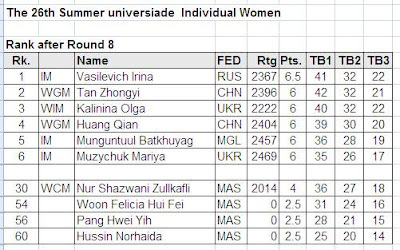 For info, at board 2, WGM Tan Zhongyi from China will play white against IM Mariya Muzychuk of Ukraine who Nur Shazwani had beaten in the first round. At board 3, another China versus Ukraine match between WGM Huang Qian (white) and WIM Olga Kalinina (black). These two games are very important for both China and Ukraine since the results will be counted for the team event. 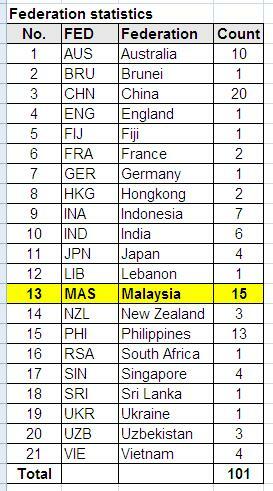 So, what is the score for the Malaysian women players before the final round? Shazwani has collected 4 points from 3 wins and 2 draws. She is ranked 30th. 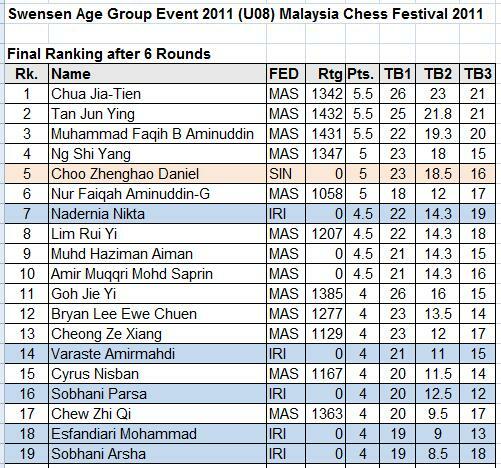 Felicia is ranked 54th, Pang is placed 56th and Norhaida is at 60th place. All the three of them has scored 2.5 points. It is very obvious that GM Li Chao of China has won the gold medal in the men event. He has unassailable 7.5/8 points. Li Chao, a DATMO champion, won all his rounds except the second round where he drew with an Ukrainian opponent. At 49th rank, Xin Hao has scored 4 points. Both Au and Fadzil has 3.5 points while Siah has accumulated 3 points. In the final round, Xin Hao has a tough match against an Indonesian International Master (IM). Both Au and Fadzil will face unrated opponents while Siah will have 2100-rated opponent. Hopefully, all the Malaysian players will win their respective final round on Sunday. The DAT Malaysia Open kicks off today. About one hundred chess players from 21 countries will battle their chess skills and knowledge over the board starting today for a week. Compared to last year, this year edition has less number of participants. It is interesting to note that China has pipped Malaysia, the host country, in the highest number of participants. China sent 20 players less three than last year. 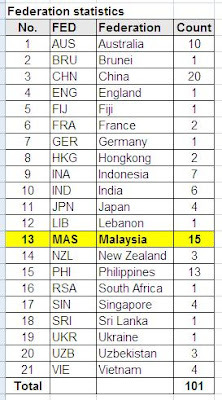 Meanwhile, the number of Malaysian players has dropped to 15 from 26. GiLoCatur believes some do not take part like Nabil, Alia, Jun Jian, Jun Feng, Jun Keat and Li Tian (just to name a few) because of the SPM, PMR and UPSR exam are around the corner. The title player distribution in this year Malaysia Open is showed by below chart. Eleven Grandmasters take part this year compared to 16 last year. GM Antonio Rogelio Jr from Philippine led the GM list. 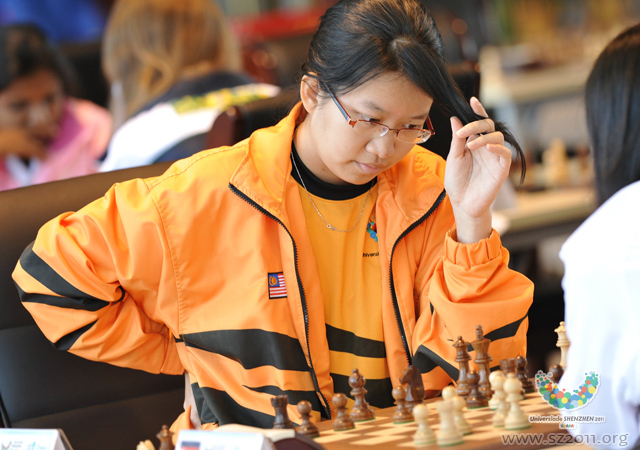 This year, Malaysia is led by IM Lim Yee Weng who did not take part last year. He is ranked 42nd. The reigning national champion. Zhuo Ren, who is just fresh from the World Junior Chess Championship in Chennai, India also take part and is the Malaysian second highest seed. Former World Police Champion, Ismail Ahmad, is also playing. WCM Nabila is leading the Malaysian women in the event which include Camilia and Renitha from Johor. 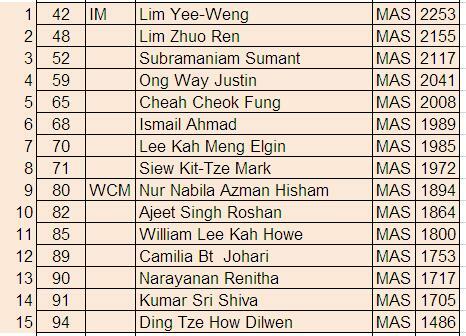 Both Elgin of Penang, the reigning MSSM L15 Individual champion, and Roshan, the reigning MSS Selangor L15 Individual champion, are also in the list. GOOD LUCK to all the participants. Let's the game begin! The Malaysian Chess Festival just kicked off minutes ago. Three different tournaments - The Malaysia Open, The Malaysia Chess Challenge, and International Seniors Open, are held concurrently at the Midvalley Cititel Hotel. 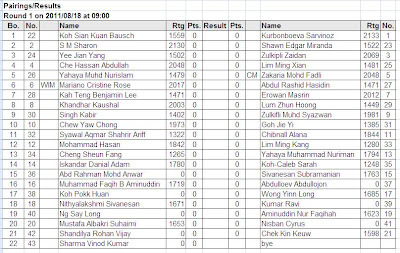 In the Malaysia Chess Challenge, there are 43 participants based on the above Round 1 pairing. 32 are Malaysians and the other eleven are foreigners including one WIM from Philippine. Can WIM Cristine Rose Mariano who is seeded sixth continue her country dominance of being the champion consecutively for the past three years? In 2008, the unrated Leonardo Carlos emerged champion from seven Filipino players. In 2009, it was Samson Jr who became the champion. Not only that, the Filipino players also were both the first and second runner ups. Last year (2010), the Philippines sole representative, Luffe Magdalaga, won the Ambank Challenge by pipping an Indian player by better tie break. Or will the top seed, 17-year-old Uzbekistani named Sarvinoz Kurbonboeva emerge champion? We have to wait until the championship is over, right?, to find out. The Malaysian players is led by Dr Zaidan Zulkipli. Along with Abdullah Che Hassan, CM Mohd Fadli Zakaria or better known as stonemaster, Masrin Erowan, Kaushal Khandar and Muhd Syazwan Zulkifli, he will lead the Malaysian youngsters to spice up the event. BEST OF LUCK to all the participants. Have fun playing chess and enjoy the Malaysian Chess Festival! 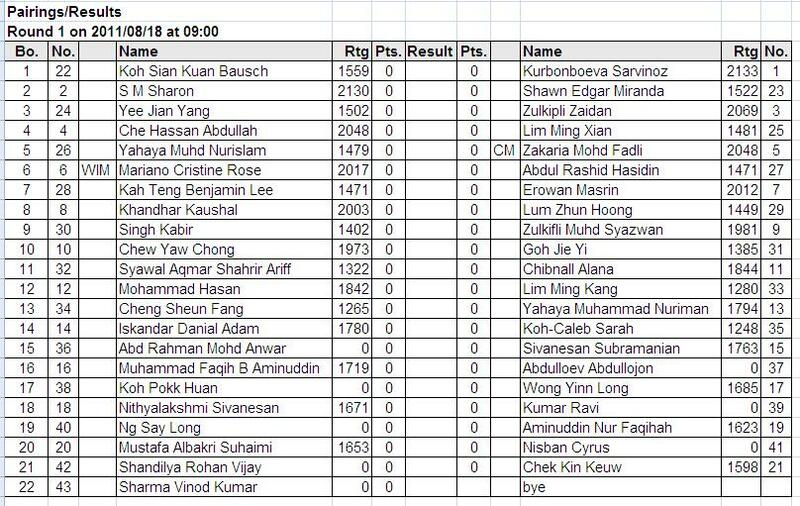 In the third round played this morning, the Malaysian chess team only had one win and two draws. 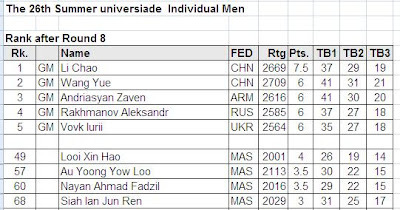 The win came from Xin Hao in the Men's event against his unrated opponent. All the other his team mates could not win over their respective titled opponents. While the draws were scored by Felicia and Hwei Yih. It is very unfortunate that Shazwani could not continue her superb performance yesterday when she was defeated by her Turkish opponent. GiLoCatur hopes all the Malaysian chess team players will give their best in the next round. We, the Malaysian chess fraternity, will be behind you. GiLoCatur also hopes that the Malaysian newspaper will highlight and cover the chess event. Round 4 that will start at 4.00pm. Chess kicked off yesterday (Monday, 15th August) morning at the 26th Universiade Games being held in Shenzhen, Guandong, China. Two rounds played in the individual event for both the Men and the Women. Who are the Malaysian players in the two events? In the Men's section, there are Au Yoong Yow Loo, Ian Siah Jun Ren, Ahmad Fadzil Nayan and Looi Xin Hao. 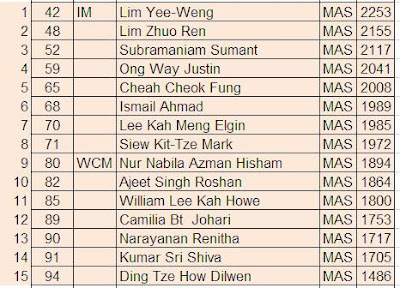 While in the Women's section, WCM Nur Shazwani, the daughter of Cikgu Zul and Cikgu Sufiah, is the leading player ranked 32nd out of the total 63 participants. The other Malaysians are Norhaida Hussin, Pang Hwei Yih and Felicia Woon Hui Fei. 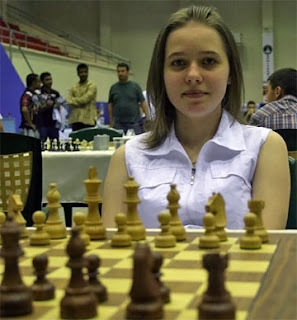 Nur Shazwani (above picture) played excellently in the first round against the top seed from Ukraine, Mariya Muzychuk (below picture, FIDE 2469). Having elo ratings more than 400 below her opponent, Shazwani shows the "MALAYSIA BOLEH" spirit to score her first "sweet" one point. In the second round, she drew playing black against Slovakian WIM named Zuzana Borosova who has elo ratings nearly 300 higher. Today at 9.00am, Shazwani will play white at table 11th against Turkish WIM, Yildiz Betul Cemre. 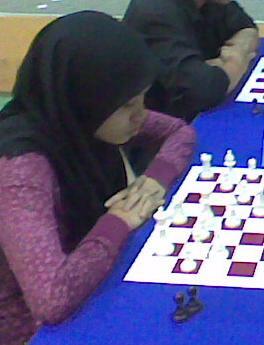 GiLoCatur hopes Shazwani will keep her excellent performance so that chess will give Malaysia medal. 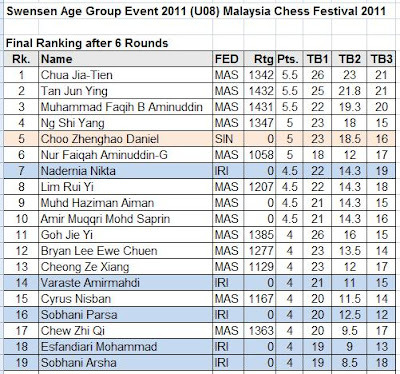 In the first round, all the four male Malaysian chess players were defeated by their respective 2500+ GM opponents. In the second round, only Xin Hao did not manage to win over his unrated opponent. The other three managed to win against their respective unrated opponents. Hopefully, all the four of them can give their heart out performance and have commendable results. In the Women's event, only Pang Hwei Yih is still scoreless. Felicia had a walk-over win in the first round while Norhaida had a draw in the second round. Come on Malaysian young ladies! 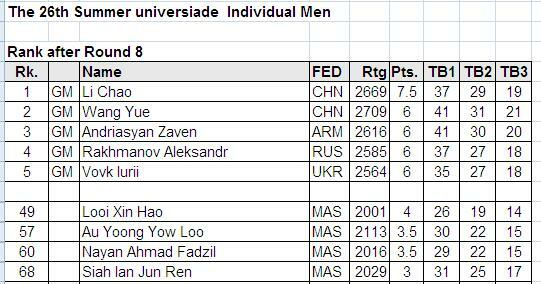 Play your best ever chess matches in the first ever Universiade appearance. ALL THE BEST! The 50th edition of World Junior Chess Championship is on going in Chennai, India. 125 young male chess players from 49 countries including Malaysia are taking part. They will play 13 rounds of standard chess format. Lim Zhou Ren is the sole Malaysian player among them. They had played eight rounds until now. So, who is leading? Surprisingly, he is not among the top three seeds who are rated at 2600+. Interestingly, two of the top three seeds are not even in the top 20 ranking. 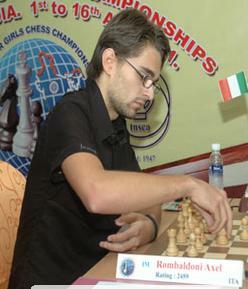 Until the sixth round, an Italian IM named Rombaldoni, Axel scored the perfect 6 points including a win over Zhou Ren and the third seed. But two Armenian GMs had stopped his winning streak. 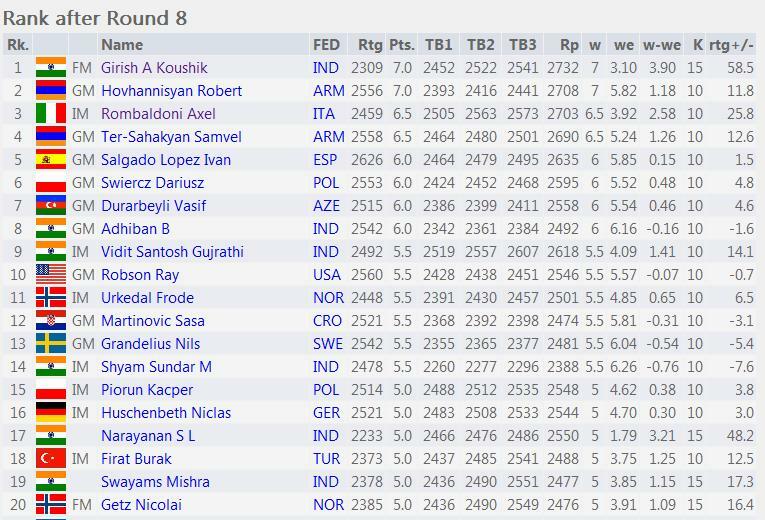 The host country, India, is surely ecstatic when its FM player named Girish Koushik is leading at the moment with 7/8 points. 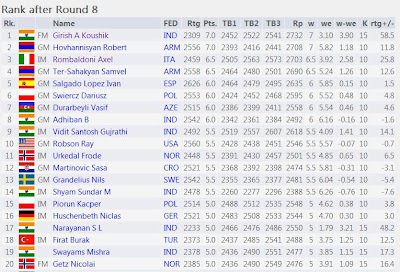 He shares the top spot with GM Robert Hovhannisyan, the player who defeated Rombaldoni and has also 7/8 points. Would it be a non GM who emerge as the champion? Five more rounds to go before the question will be answered. SALAM 1 RAMADHAN KEPADA SEMUA UMAT ISLAM DI SELURUH DUNIA AMNYA, DI SELURUH MALAYSIA KHUSUSNYA. PALING ISTIMEWA KEPADA SEMUA PEMAIN2, IBUBAPA & PEMINAT2 CATUR DI SELURUH NEGARA. SELAMAT MENJALANI IBADAH PUASA! 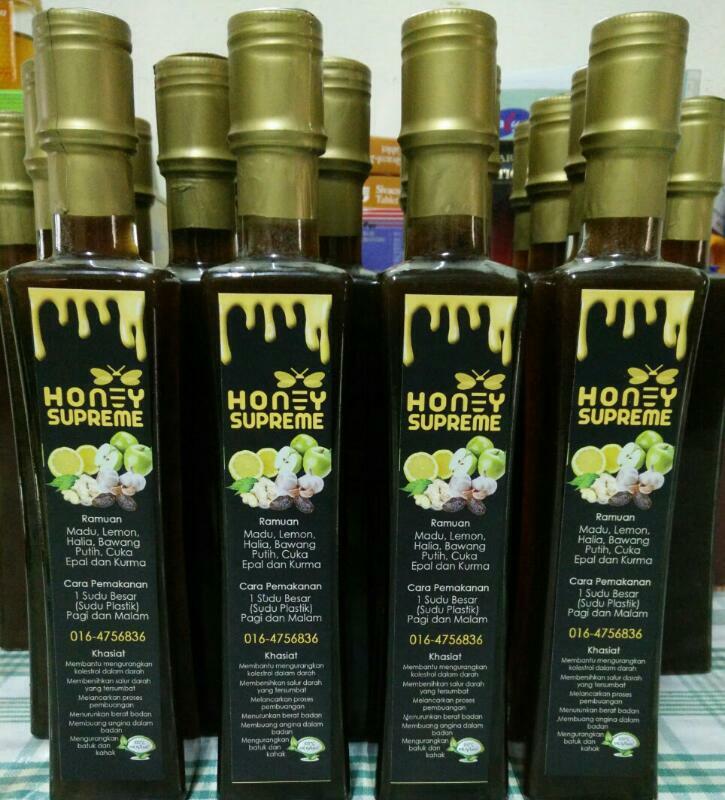 SEMOGA IBADAH PUASA KITA PALING TERBAIK TAHUN INI DAN BERAMAL IBADAHLAH SEBANYAK MUNGKIN.